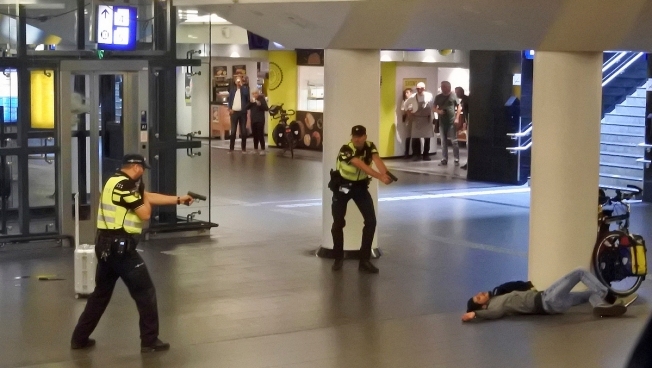 "From the suspect's statements so far, it is clear the man had a terrorist motive..."
Dutch police officers point their guns at a wounded 19-year-old man who was shot by police after stabbing two people in the central railway station in Amsterdam, the Netherlands, Friday Aug. 31, 2018. Police investigators in Amsterdam included an extremist attack as a possible motive for the stabbings of two people at a busy railway station Friday as authorities in the Dutch capital reported that the suspect shot by police is an Afghan citizen. An Afghan asylum-seeker accused of stabbing two Americans in Amsterdam believes that Islam is insulted in the Netherlands, Dutch prosecutors said Monday, giving the first indication of why they think a "terrorist motive" was behind the attack.